In 1943, a high level conference (codenamed "QUADRANT") took place in Quebec to discuss Allied strategy for the war both in Europe and the Far East. Prior to the the conference, a joint Anglo-American planning team proposed that invasion of Japan take place in 1947-1948. This plan was however ultimately rejected, and both the British Chiefs of Staff Committee and the United States Joint Chiefs of Staff agreed that Japan should be forced to surrender within a year of Germany's defeat. How to force a Japanese surrender of course remained an open question. The US Navy urged the use of a siege of the Japanese home islands, by combining blockade and aerial bombing. 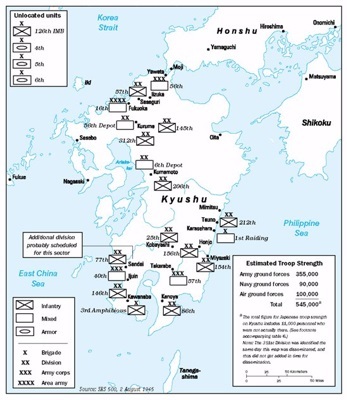 This would be facilitated by operations to seize territory, and thus establish forward airbases in Korea and mainland China. Opposing this strategy however, the US Army argued a siege strategy would prolong the war with no definite end in sight. The US Army favored an invasion of the Japane home islands. The disadvantage of course of this approach, was the high casualties that might be expected, the logistical difficulties, and the fact that Japan has relatively few beaches suitable as landing zones (which would therefore all be heavily defended). Ultimately, the Army's approach was favored, and an invasion strategy was developed.